Axl Rose is not ruling out recording new music with the partial reunion of GUNS N' ROSES' classic lineup. 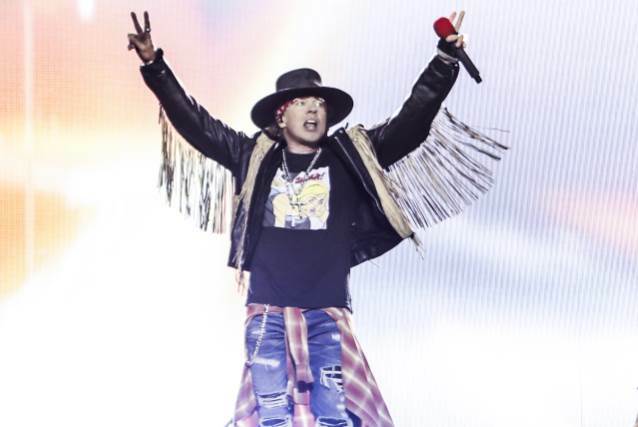 Asked in a rare interview with Iceland Magazine if he has considered putting out new material with the current lineup of GUNS N' ROSES, more than two years after the launch of the band's "Not In This Lifetime" tour, Axl said: "Right now our focus is on touring and the shows, but everyone seems to be getting along, so you never know." Rose also talked about how he and his bandmates manage to deliver such high-quality performances night after night, despite the fact that each concert is more than two hours long. "Everyone just wants to do their best for the fans, each other and our crew," he said. "Everyone pushes each other with their performance and commitment. And with highlights, every show, every crowd is different with something to remember about each one." The "Not In This Lifetime" tour features classic lineup members Rose, Slash (guitar) and Duff McKagan (bass) backed by guitarist Richard Fortus, drummer Fank Ferrer, keyboardist Dizzy Reed and new second keyboardist Melissa Reese. The last GUNS studio album, "Chinese Democracy", came out in 2008 and featured only Axl Rose from the band's classic lineup. The last album on which Rose, McKagan and Slash appeared together was 1993's covers set "The Spaghetti Incident?"